Due to the backplane connector used, each pin can carry maximum 1Ampere (the max voltages of the connector and the creep-age distances on the PCB need also to be considered). If more current (or higher voltage) is necessary, or when special cables have to be used, the connections have to be made via back panel. It is recommended for to the digital signals to use 5V and for the analog signals maximum -12 to +12V (respectively -15 to +15V). Since the ElecX is a platform for professionals, it could also be deviated from that and use 3V3 digital signals or -15 to +15V instead of 12V. If a ElecX user uses different voltages coding cams on the 96pin connectors should be used. This would prevent a board of a different voltage could be plugged in accidentally. Almost all signals are fed parallel through the backplane. The pinouts are not included on this spec since they are available in a spread sheet that can be sorted as you desire. You find it here in LibreOffice format http://www.linurs.org/ElecX/download/pinout-1.0.ods. Signal names containing numbers below 10 have a preceding zero for easy sorting. Simple boards can make use of the less costly 64 pin connector. A 96pin connector would cost a bit more but requires also easily a 4 layer PCB to have all its pins connected. On the backplane there can be just one master board. All other boards need to be connected to this board. The user of the modules is responsible to not create any signal contention (two masters, or two slaves that use the same signals). To be flexible slaves could therefore contain jumper blocks or electronics to set where the signals should be put onto the backplane. In general the ElecX concept requires users that know what they do. It is something for professionals or beginners that want to learn and accept if they do mistakes. More advance boards should make use of contention resistant solution as open collector outputs for digital signals (including Uart TX) and higher impedance outputs for analog outputs. A I2C memory device should be put on every board to identify it. Master boards do not have to have a I2C memory device here, since they do not have to identify themselves to the slaves. Every slot of the backplane has a 3 bit address, this allows up to 8 slots. The slot address can be read, but a common way is connect it to a I2C memory chip so all those memory chips have different addresses. It is planned to create an small etched PCB board that holds the common stuff and has due to its strip form an affordable price. 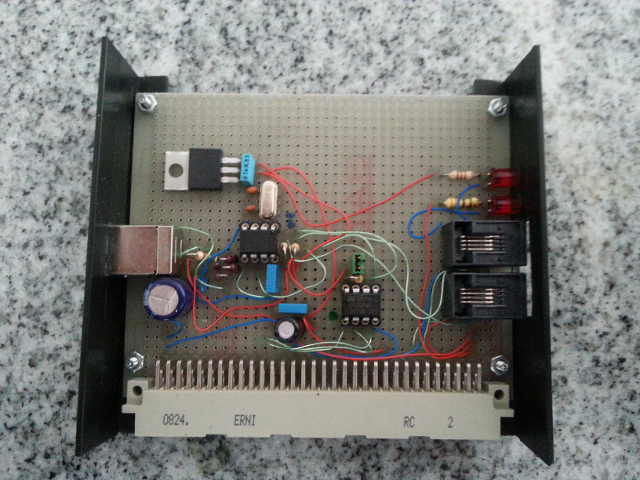 This board can be connected to an prototyping breadboard. Usually the slave boards are just interfaces and the master board does the signal processing. On a backplane, there can be just one master to process different slave boards. Otherwise an output conflict occurs. To prevent this, the boards could be mechanically coded to Master and Slave boards. Master boards support a limited number of Slave boards and not all signals have to be supported. Master boards can be a: Micro controller board, FPGA, CPLD, Analog computing circuitry (Multiplier, RMS, Filters, ... ), Interface to external computer (serial, USB, Parallel Port, bluetooth). The pin out is different, since most signals are unidirectional. This means where a slave has an output the master has an input. If a backplane is to short it can be expanded by a jumper backplane, since all signals are parallel. To have multiple masters, multiple backplanes are required to create a hierarchic structure of Masters boards. The same method as used for regular expansions with jumper backplanes is used. However a connector with a special pin out (Master connector) is placed underneath the backplane. Those signals are fed from the Master connector to the other backplane. The following shows the typical backplane configurations. The layout of the backplane can be kept universal and assembled differently (or use a dummy connector in between to just connect where it is desired ) to serve different purposes as: Regular backplane, Jumper Backplane or Multimaster backplane. 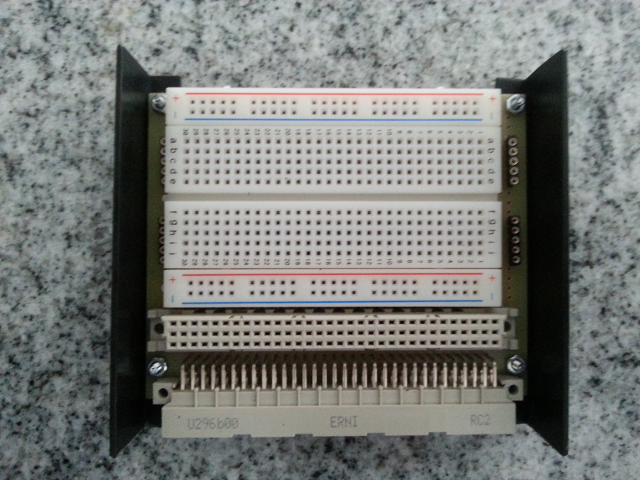 Due to the limitation of 8 slot addresses just one jumper backplane is possible. If more jumper Backplanes are used the I2C chips identifying the modules would get bus contention. If simple boards are used without such chips, then this limitation would not occur. In case of multi masters the limits are in the physical size and the limitation in current flowing through the connectors. To identify the board to the user looking at it, a board or module shall have its proper and preferably unique name. Any printable ASCII character is allowed except hyphen and dot. Also numbers are allowed to indicate important things as number of microprocessor. A hyphen character indicates that the following numbers are part of the board or module number. The first numbers followed are the major versions of the board. Different number tell that there is a incompatibility but the board still having the same name still serves the same purpose. Small improvement, enhancements and bug fixes increase the minor number after the major version number, as character to separate a dot is used. This number is considered as modification number and should no create any incompatibility to previous boards. It is still possible to develop and enhance boards of older major version numbers. Atmega16.1.0 Cpu Board with a Atmega16 microprocessor, fist version, no modifications so far. A 24C02 I2C memory device is used with 256Bytes, 3Address pins are available on this device so 16 ElecX slots are supported. Larger I2C devices don't use all 3 address pins. The backplane could also be replaced by wire wrap connectors or a application specific backplane requiring just 2 PCB layers.